Welcome to our Free Math Sheets for Converting Measures page. 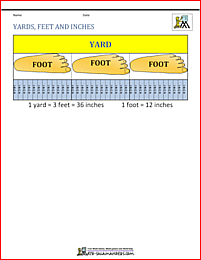 Here you will find our range of 3rd and 4th grade sheets to support your child in learning to convert between customary units of yards, feet and inches, or gallons, quarts, pints and cups. On this webpage, you will find a range of measurement worksheets to help your child learn to convert between different customary units of measurement. These sheets will also help children apply their times tables skills in a relevant and meaningful way to convert units. The sheets have been carefully graded with the easiest sheets first. Their is also a range of support sheets available to help children with their conversions. The sheets have been designed for children working at a 3rd or 4th grade level. convert between gallons, quarts, pints and cups. We also have a selection of converting worksheets for metric units. On this page we have a selection of worksheets for converting between kilometers, meters, centimeters and millimeters. There are also sheets for converting betweeen kilograms and grams, and also liters and milliliters. Take a look at some more of our worksheets similar to these. These sheets involve reading scales going up in halves, ones, fives, tens, fifties and hundreds to find the length, weight or liquid capacity. 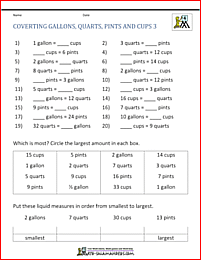 Here is our selection of measurement worksheets for 4th graders. These sheets involve reading scales in both the standard and metric systems. The scales include finding the length, weight or liquid capacity. read a scale going up in tenths, fives, tens, fifties, and hundreds. Using these sheets will help children to consolidate their fractions and place value learning.